The "Lost World" plays a major role in many movies featuring prehistoric monsters, movies that can be attributed to various genres, like fantasy, science-fiction or horror, but are tied together by this characteristic element. The Lost World is not a coincidence in all these different movies, but a crucial part of a good story. First let's shortly consider what a Lost World can be, there are various variations of this story element, even if they all share some common properties. The idea of survival of prehistoric monsters in isolated regions of the world was created in the appropriately named novel by Arthur Conan Doyle "The Lost World" in 1912. 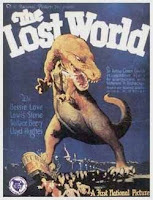 It's the classical Lost World, made to a movie in 1925 (The Lost World, U.S.A.), a remote region in the Amazonian forest, delimitated by steep cliffs and mountains, isolated from the rest of the world and so hidden, that even time forgot this land. 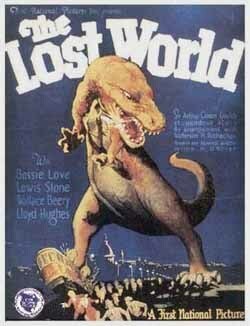 This Lost World is used widely in later movies, with minor variations - remember the various "King Kong" (1933) versions (and copies), with remote islands or jungles, "The valley of Gwangi" (1969), with a lost valley, "The Land Unknown" (1957) and "Land that Time forgot" (1975) , also "The last Dinosaur" (1977) - where the prehistoric land is isolated by the ice of Antarctica from the rest of the world. Jules Verne located his Lost World in the centre of the earth (1864 "A Journey to the Center of the Earth"), theme adopted by the novel based U.S. movie of 1959 "Journey to the Center of the Earth", and reused in "At The Earths Core" (1976). An advantage of this kinds of Lost World is the apparent possibility to gather creatures of all kind of time periods, the classic dinosaur's encounters cave men situation. Modern videogames (like the Turok series) locate the Lost World in outer space, some movies used distant planets, like "Planet Of The Dinosaurs" of 1978, or a comet, see for example "On a comet", a 1970 Czech film based on a novel by J. Verne, despite the improbability of the same (or very similar) evolutionary path like earth, here dinosaurs did not or did not yet go extinct. The Russian film "Planeta Bur" ("Storm Planet", 1962) is about an expedition to Venus that discovers dinosaurs. 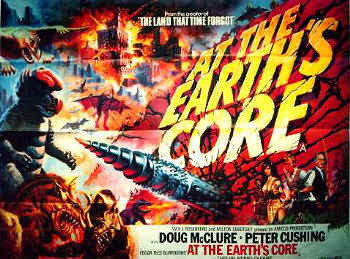 The film exists in many recut versions, including "Voyage to the Prehistoric Planet" and "Voyage to the Planet of Prehistoric Women". Also a plausible location (at least for a science-fiction movie) is a parallel dimensions or an alternative reality ("Adventures in Dinosaur City", 1992), where time and evolution developed other than by us. The man made "Lost Word"
A modern, to the scientific advance adapted version of the isolated Lost World was introduced by the novel of Michael Crichton "Dino Park" (1990), where a remote, however inconspicuously Island is populated by genetically recreated dinosaurs. Here a Lost World is created artificially, theme readopted in the sequels ("Lost World" 1995 and "Jurassic Park III" 2001), however in the latter cases with elements that made it more naturally - the dinosaurs are left alone on the islands and begin to evolve. Also a modern variation of the genetically created population is the time travel created population, where by time travel technology creatures of the past are brought to the present to live on a modern Lost World (used in the video games series "Dino Crisis" 1999). This new introduced element leads us to the next general versions of Lost Lands. The "World lost in Time"
Here the Lost World is not so much a foreign element, because in fact it is located in its correct time. However two possible subgenres can be differentiated, in the first we experience the adventures of time appropriated heroes, like dinosaurs or cave men, in the second one modern people use time travel technology to enter this world, like spatial barriers, here temporal barriers have to be overcome. It must be said that the scientific and temporal accuracy of this Lost World mostly is reduced on a summarized, general past, where dinosaurs, mammoths and cave men, sometimes even ancient civilizations, live together. One of the first examples of this kind is the U.S. production "Brute Force" in 1913, where also the dinosaur as bloodthirsty monster is introduced in the movie world, one of the most popular movies is "One Million Years B.C." (United Kingdom,1966). Other examples include "When Dinosaurs ruled the Earth" (1970) and "The Creatures the World forgot" (1971), and "Slave Girls" (!!) (1967) clearly shameless ripp-offs from the original. The second subgenre is again more used in video games, where the heroes fight they way trough prehistory to return in their time, or vice versa like in "Journey to the Beginning of Time" (U.S./Czech production of 1955). An intriguing modification of this time-traveller approach is the post apocalyptic world in which extinct monsters got revived and clash with human survivors, like in the B(ad)-movie "Yor". A modification of the Lost World theme is to let survive from the past only single elements, like an individual dinosaur entrapped in ice or remains (bones, tissue) of a prehistoric creature conserved in the sediments. The first idea was used in classic monster movies like "The Beast from 20,000 Fathoms" (U.S.A. 1953), "Godzilla" (Gojira, Japan 1954), "Dinosaurus!" 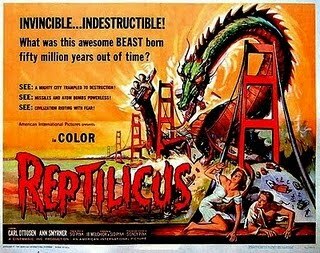 (1960), the second idea, a prehistoric monster reborn by self-regenerating tissue from a borehole, is realized in a shlock masterpiece "Reptilicus" (Danish-U.S.A. production of 1961). In all this variations the Lost World is an important element to tell the story, it's a stage were the drama is performed, but a particular one. The Lost world is, said it simplified, a version of the haunted mansion, a classical element of a historic horror story. The Lost world itself is threatening, strange creatures lurk in it, animals but also men-eating plants, even elements of the landscape, like quick sand or rock fall, are deadly traps. The spatial and temporal barriers, so often emphasized in these stories, have two effects, first they provide a rational explanation for this world, and why we never heard about it, second they act as point of no return, as slippery ground, once trespassed the wall that separated the humans of the reign of King Kong, the monsters get loose, the hero can't turn back and the story develops to its acme. To make this world even more real for the spectator, by explaining it in a rational manner, to guide us trough this world is a scientist, who also knows the weak point of the monsters, and, if not self involved in the battle, helps our athletic hero to fight the beasts. The jungle or caves of the Lost World confines not only the space where the story and hero acts, but gives at the same time the classical opponent (dinosaur, monster) both possibilities for a direct attack and hidden attacks - for example the dense vegetation of a jungle provides a lot of places to hide for the monster, from where it can suddenly jump out and attack. The danger in such a three-dimensional world can come from every directions, as example in many stories not only land dwelling dinosaurs attacks, but also flying pterodactyls. Perpetual pressure is acting on the hero (and tension on the spectator), confining the space, with danger all around; the hero is entrapped and can't get help from outside. The Lost world has another advantage in regard to other confined places (like a spaceship, see "Alien" 1979), the jungle can host a variety of creatures, various opponents can attack in short intervals, without appearing repetitive, in fact many bad monster movies after the first attack reduce the plot to a repeated repetition of the same attack techniques. Another element in such stories is the use (or misuse) of evolution, which I will try to address in a second post.